The Permanent Court of Arbitration has issued a Press Release following meetings held in Singapore during the week of 24-28 July 2017. Delegations from Timor-Leste and Australia held a series of confidential meetings with the Conciliation Commission as part of a structured dialogue being conducted pursuant to the United Nations Convention on the Law of the Sea. 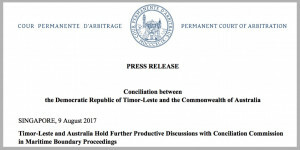 The conciliation concerns the maritime boundary between Timor-Leste and Australia and was initiated by Timor-Leste in April 2016. All documents related to the conciliation issued by the PCA for public access are available here.